Occasionally I curate a book list that is primarily about satisfying my 6 year old self. My list of books about fairies and dollhouses was one of those lists, and so is this list of children’s books about teatime and tea parties! Tea Rex by Molly Idle. A very clever book that both fans of teatime and fans of dinosaurs will giggle at. I love the way the text follows a “teatime rulebook” while the illustrations demonstrate the absurdity of what happens when a dinosaur follows those rules. Tea Party in the Woods by Akiko Miyakoshi. Kikko follows her father through the woods with a pie that her father has forgotten on the way to grandmother’s house. Along the way she stops for a tea party with the woodland animals. But the real star of this teatime book are the illustrations. 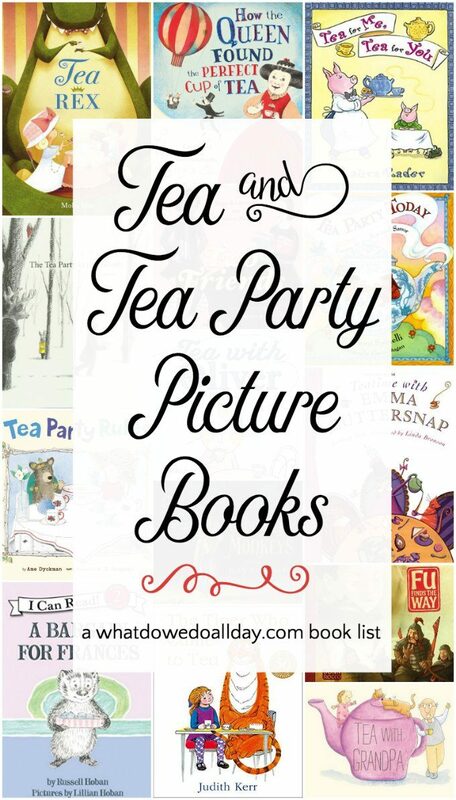 Tea Party Today: Poems to Sip and Savor by Ellen Spinelli. I love that I was able to find a book of teatime poems. The poems are nice and simple but have a fun rhythm and are perfect for younger children, too. Fu Finds the Way by John Rocco. When the young Fu accidentally hits the warrior Chang with a plant, the strong warrior challenges him to a duel. Fearful of the upcoming battle, Fu seeks guidance from the local Master who teaches him the Chinese tea ceremony. Fu worries about his lack of fighting skills, but it turns out the ancient tea ceremony is exactly the knowledge he needs. How the Queen Found the Perfect Cup of Tea by Kate Hosford. I especially enjoyed Gabi Swiatkowska’s illustrations in this lively story about a queen who travels to several countries in a hot air balloon and encounters several different tea time rituals. When she makes it back home, she invites her new friends from Japan, India and Turkey to enjoy a pleasant tea party. Great fun. Tea with Grandpa by Barney Saltzberg. This is a sweet, rhyming intergenerational story about the pleasures of spending time with extended family members. There is a fun, modern twist at the end! Teatime with Emma Buttersnap by Lindsey Tate. A narrative about Emma and Great-Aunt Prudence getting ready for tea time is the backdrop for all sorts of facts about the history and practice of tea time. This is a good book for kids who really want to learn a lot of factual information about tea, but not the best for a quick story time. Still, a worthwhile read for tea fans. Cloud Tea Monkeys by Mal Peet and Elspeth Graham. 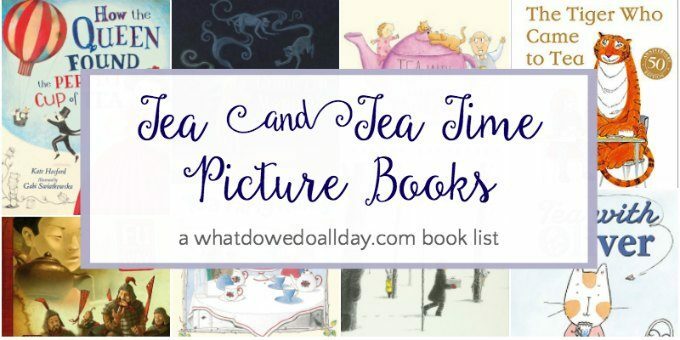 This book is quite different than most of the picture books about tea parties on this book list. Tashi goes to work on the tea plantations as a replacement for her mother, when her parent falls ill. She is too small and young to be an effective laborer, however, and she falls into despair. The mystical tea-picking monkeys of the Himalayas come to her rescue. A beautiful book with a wonderful story. Tea with Oliver by Mika Song. A sweet and funny book about a cat who wants a partner for tea time. Philbert, a timid mouse wonders wants to join Oliver but he worries about how he can get Oliver to notice him. This story is not as much about the tea party as it is about making new friends. The Tiger Who Came to Tea by Judith Kerr. This is a classic picture book about a friendly tiger who shows up one day, eats all the food and goes on his way. As a result the family has to go out to eat. There’s just enough absurdism to keep things clever but not enough to overpower the story. Tea for Me Tea for You by Laura Rader. Preschoolers will love this silly rhyming tea time party with ten pigs and one very exhausted waiter! A Bargain for Frances by Russell Hoban. Who doesn’t love this classic book about how Frances’ friend Thema tricks her into buying her tea set. A wonderful, timeless story about friendship. And finally, can we discuss how awesome teaching your child to use a real tea set would be, and this Children’s size china tea set is ADORABLE. But if you need something slightly less — er, expensive — you can’t get much sweeter than this set. Erica, it’s been a ridiculously long time since I’ve stopped by and I’m reminded of what I’ve been missing! I have a friend who’s REALLY into tea and would love these books. What a great collection. And, of course, I love seeing Ame’s book topping the list 😀 I hope all’s well with you! Glad you stopped by again!